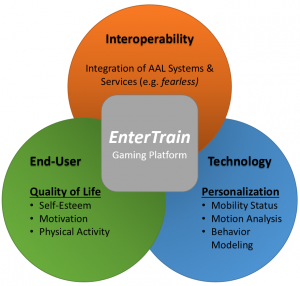 In EnterTrain, new, innovative technology for sensing relevant mobility and gaming characteristics of individuals is used to drive a personalized gaming platform that serves the needs of the end-users in their private homes and increases their quality of life. Interoperability with existing AAL systems and services is guaranteed by relying on open standards and a commonly used 3D sensor. The objective of EnterTrain is given by its name: enhancing the health and quality of life of independently living older adults by motivating them for physical Training in an Entertaining way. It is known that physical activity is important for older adults at any age and health status, from a healthy 50-year-old up to a frail 80-year-old. It can enhance the quality of life by reducing risks of some chronic diseases and relieve depression. Additionally, it has positive effects on fall prevention, the mobility and consequently supports people towards a more independent life. A nowadays popular solution for enhancing the physical activity of older adults is to provide them with computer games which are played via body movement and thus have the inherent effect of unobtrusive physical exercise: so-called exergames. These games are based on common sensors that track the user’s movement such as the Microsoft Kinect and can therefore easily be played at home. The core idea of exergames is that they persuade older adults to exercise more simply because it is fun to play, but there are known barriers to be overcome. First of all, to be accepted by older adults the game must be designed for non-skilled users. This includes clear user interfaces, suitable game topics, avoidance of small objects and the encouragement by visual and auditive feedback. Also the social factor, e.g. by providing multi-user games, has to be considered. Most of these guidelines are usually not met by commercial games aiming at the broad market of young digital natives, but there still exist suppliers for such specifically designed exergames, such as the consortial partner SilverFit. However, besides these general rules, a very crucial requirement is to mind the mobility of the individual user, as many age-related processes have an impact on the ability to move which might differ from the skills needed to play the game. Common age-related changes are decrements in posture, balance, gait, strength and fine motor skills, impacts on visual and hearing senses as well as impairment of memory, attention and vigilance. Additional aspects to be addressed are longer reaction and overall movement times and the increased risk of falling. The high importance of this personalization aspect is given by its high correlation with the older adult’s motivation to play continuously and hence with the acceptability of the platform: If a frail 80-year-old is confronted with games that require unachievable movements, she/he will feel overstrained and soon lose interest. On the other hand, if a healthy 65-year-old is confronted with unchallenging game tasks, she/he will feel bored and will lose interest as well. 1. The platform autonomously learns from the individual playing habits what kind of games are preferred by the user as well as his/her playing skills from the game performance, and uses this information to provide a more personalized and inspiring gaming experience. 2. A permanent movement and activity analysis, enabled by the 3D sensor already used for exergaming, is used for the automatic monitoring of the user’s mobility status. The outcome of this process is a personalized mobility model that is again used to control the configuration parameters of the gaming platform, such as the list of games recommended to the user, game modes (e.g. playable from a sitting or standing position) or more detailed ones like the step length needed to play a game.